The intelNews project is a collaborative effort by two experts, Dr Joseph Fitsanakis and Ian Allen. They both specialize in the field of intelligence. You can find out more about them here. Q. Why are you doing this project? Our aim is to highlight and discuss, in a timely, responsible and reflective manner, the role of intelligence operations in national and international affairs. In doing so, we aim to encourage public discussion on a critical aspect of security and to provide the world’s media with informed and responsible commentary on related topics. For more information, please read our brief mission statement. Q. How long has intelNews been online? IntelNews is the most recent incarnation of a project that began in 1988, during the BBS days of the early Internet (see here for more on our history). We began the beta version of this particular phase of the project on November 16, 2008. We went officially online on January 1, 2009. Q. What are your politics? It is not an easy task to summarize or categorize our politics. As intelligence experts, we want to live in a safe and secure world. At the same time, we object to using this broad goal as a pretext to shield the intelligence community from democratic accountability and administrative transparency. In short, we like the idea of security; we don’t like the idea of a security state. We believe that intelligence institutions, like other areas of government and the state, should operate democratically and be subject to strict popular oversight. Thus we are often critical of some of the unorthodox methods and policy myopia that inform the uses and misuses of espionage and intelligence. Q. Don’t you think it’s wrong to publish intelligence information? 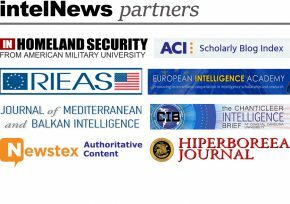 The publication policy of intelNews relies on OSINT (Open Source Intelligence) standards and is strictly limited to information that is publicly available through declassification or, in some cases, genuine whistleblowing. Q. Is the use of intelNews totally free? How are you compensated for what you do? The intelNews project does not operate with the aim of monetary profit. We are compensated by seeing our visitor numbers grow week after week, month after month. We also enjoy building a stable, faithful readership mass comprising of both scholars and non-experts alike. We are always grateful when visitors contact us with words of appreciation, or even complaints about something we wrote, or an intelligence-related news story we posted or failed to detect. The satisfaction that derives from service and communication is far more important than monetary compensation. Nevertheless, if you would like to support this project financially, please contact us. We will be grateful for any assistance you can provide. The expenses involved in running this site come from readers’ donations and from our own pockets. Q. Is this project part of an intelligence operation organized by some spy agency? Absolutely not. IntelNews is not affiliated with any intelligence or security agency of any country. Q. I am a webmaster. Can I repost your news headlines or original content on my site? If you find our original columns interesting and well-researched, we encourage you to consider reprinting our articles on an occasional or regular basis. However, note that all original content found on intelNews.org is the property of the website and its authors. You may share intelNews content on on your website or blog, but you must prominently refer to intelNews.org and the author(s) as sources by linking to the original intelNews article at the beginning, not the end, of your post. If you seek original content by intelNews editors for your website or blog, please contact us. Q. I represent a media outlet. Could I contact you for an interview, consultation about a story, etc? Yes. You may email us by clicking here, or you may call us in the US on ++1 (423) 742-1627. Q. I am looking for a public speaker specializing in intelligence. Are you available? Yes, we often give public speeches for a variety of audiences, some of which are available on our YouTube page. Please see here for more information. Q. I am a freelance columnist. May I write for you? Feel free to send us your intelligence-related articles, but be warned that the chances of us publishing them are slim, unless they are professionally written and represent major contributions to the field of intelligence. Click here to email us. Q. Would you help me find an intelligence-related news report that caught my eye sometime ago, but which I am now unable to trace? We are always willing to help. Send us an email with as much information as you can gather about the news report in question and we will get back with you with our findings. Q. What is your comments-posting policy? You can post just about anything in here, so long as you (a) stick to the same identity; (b) don’t resort to racism and bigotry; (c) don’t spam; (d) refrain from posting in all-caps; (e) write legibly and in English; and (f) focus on the issues and refrain from ad hominem attacks against the site’s editors or other commentators. There will be absolutely no tolerance for anyone who does not follow these rules, and any messages that are found to be in violation of these rules will be immediately and permanently deleted. For more information on our comments-posting policy, contact intelNews. it’s an interesting website you guys have got going.it’s just crazy to read so many stories with so much fat in them. well we live in the world free information.let the world know what is behind them. Thanks for linking to my site about Jean-Pascal Couraud, a former Pap’ete editor allegedly assassinated on orders of “ex”-DGSE spies. His remote disappearance is casting light on allegations of deep and massive global corruption involving Clearstream bank … I look forward to reading more on your excellent looking site and express support for your professed goals towards more transparency and accountability in the intelligence world – recent events illustrate well the need for more independent information in this area. Only one thing worries me … why is there so little about any of you online? As a journalist, I am vastly encouraged to be living in end times, although I prefer to refer to an “end-of-secrecy” era. Myself I auto-publish my own personal deposits online via email alerts from my bank. My withdrawals too, when I get around to uploading the PDFs manually. Older generations like me may be unsettled by the level of indiscretion shown by younger generations on sites like Facebook, Bebo and so forth, but I find the transparency admirable. If we look at trends towards ever greater transparency, we will, eventually, feel comfortable emailing our curriculum veritas to employers, confident in the knowledge everyone else is being equally transparent. Or, confident in not giving a toss about old school fretting about secrecy at all costs. It is this approach, after all that apparently lead to this much needed kind of website being set up – centuries if not millennia of secrecy based governance leading us to today’s situation of global meltdown, fiscally and environmentally. I have to admit to no small amusement at the thought of a spook expert finding it “unsettling” and “frightning” that some people might look at their details online – the pen truly is mightier than the sword ! But the “us folks” ambience of your concern is either astonishingly naive or, as you suggest, somewhat suspect in itself. Let me recap: this is a public website. You two have worked in spookville for decades. Neither of you are by any definition aw-shucks “us folk” but by your own definition two leading experts in what is a hugely controversial area known for endless layers of front men, front organisations, occult (as the French say) funding, so much so that it would be easily unprofessional of me or any other journalistic to take such thin identities at face value. To lay back of hand to fevered brow, and declare how frightful this all is seems … yeah, well, thin, too. I completely respect the fact that intelligence operatives don’t go around updating their Bebo page! That most of their activities need to stay secret to be effective, comments above notwithstanding. However we slice and dice the secrecy aspects, what this comes down to is a question of credibility – and there are not enough links in your curriculum vitae – actually there’s no curriculum vitate at all ! – for me, at least, to feel completely confident I’m getting the real deal. No doubt you are well known amongst your peers and colleagues, but this is the world wide web, emphasis on the world bit. Thanks for your explanation. Since launching this effort, Ian and I have been contacted by several media outlets and have been happy to supply our professional credentials, including academic affiliations, whenever requested to do so. We have, however, made a conscious decision to keep intelNews separate from our institutional affiliations, in an effort to protect both. Nevertheless, I do want to stress that neither Ian nor I have ever claimed to be “leading experts” in the field of intelligence. We simply have practical and scholarly interests in intelligence, and advocate for increased transparency (within reason) in all related aspects. Our scholarly and practical expertise aside, we respectfully request that the value of our contribution be judged primarily by its content, rather than by the perceived “thickness” or “thinness” of our identities. Nevertheless, we encourage people who find us, or our effort, suspicious to seek other sources of information. Just for the record, by far the largest part of the intelligence-security complex has to do with protecting privacy from those who conspire to invade it. The people who work in this field are usually intensely private and markedly respectful of privacy as a principle. It is therefore erroneous to assume that intelligence work and respect for privacy are mutually exclusive. Well, I might as well come out of the closet. I grew up in the CIA as a dependent. I found Jason Brown’s comments regarding “transparency” a little unsettling. First of all, I am not at all certain that the younger generation has any appreciation for the very real human lives that are at stake in this field. For them, it appears to me that on a superficial level, they express outrage at many of the wrong things, and in addition to that, are equally “naive” in their transparency. Mr. Brown, what you refer to as “spookville” is very much a community, both at home and abroad and it is filled with real human beings who value much of what you say and work tirelessly for your right to say it. Just because this is a “public website” does not make it any less important to protect people’s privacy anymore than a public facility should do away with doors on “public restrooms”. Your analogy is somewhat dismissive and therefore, can be dismissed. To the editors: A very well done website. I’ve enjoyed the articles. Your writing is well crafted, your opinions are well presented, even if I do not personally agree with all of your conclusions. In all, I say: Bravo! Well done! Good reporting, is good reporting. Your comments are paranoid, and unproductive. If you wish to be taken seriously, please cease dropping acronyms as if you were truly familiar with them. The rest of us wish to get on with the real meat of these matters and have little time or patience for your tired rhetoric regarding agencies that may, or may not, exist. As someone who grew up in CIA, and further in the middle east, as well as the former eastern bloc, I find your analysis of the current unpleasantness over-simplified in the extreme. And in particular, offensive to cultures with which you clearly are not familiar, nor are you well versed. Your hypothesis assumes a stupidity on the part of middle eastern nations, not in evidence. If your comments were removed I have no doubt that it was due to your colonialist assessment of matters which are clearly beyond your comprehension. Appreciating the time and energy you put into your blog and in depth information you present. It’s good to come across a blog every once in a while that isn’t the same out of date rehashed material. Fantastic read! I’ve bookmarked your site and I’m including your RSS feeds to my Google account. First, I want to thank both Joseph and Ian for this blog: it is an excellent source of information and since discovering this gem I make sure to check in daily. You two do a truly remarkable job! Second, I am immensely interested in actual spycraft, and the day to day activities for a CIA intelligence officer. I am currently writing a novel (or rather attempting to at this point) and any information to enhance the story in a realistic manner is appreciated. If interested in providing me with insight that could only be provided by somebody who knows the intelligence community and how it works, I can be contacted at the following email address: erikwilliams@walsh.edu. Unfortunately online and scholarly research into the intelligence field can only take me so far and it would be nice to speak with somebody directly. Again, you have done an excellent job with the site and I look forward to continuing to read every article posted!